1997 by J. Gregory Payne Ph.D.
Snipers are coming in from out of state to even the score. LSD is now in the water supply. The revolution will begin at Kent. Two hundred students from Akron will overrun the town. Although there was much debate concerning the incident, many Americans viewed the Kent shootings as having one beneficial feature: students would now know the limit. To another segment of Americans, the Kent State and Jackson State shootings were domestic examples of the genocidal warfare waged against any person or country opposed to the policies of those in power in America. Doubt concerning the Kent State deaths and unresolved questions surrounding the events at Jackson State resulted in further calls for the Federal Government to convene a commission dedicated to investigating the incidents. During the last week of May, 1970, presidential news aide Herbert Klein announced the impending appointment of a "high level commission to get to the bottom of the facts. "(82) The statement was challenged by another White House aide, Gerald Warren, who remarked that the commission's purpose "wouldn't necessarily be to get to the bottom of the facts of the shooting," but instead would be more of a "broad study. "(83) This reaction aroused suspicion among those seeking a thorough investigation of the Kent incident. Such fears were somewhat allayed by the choice of those to serve on the commission, which began its investigations on June 25, 1970. (84) Nonetheless, the commission was told to have the report finished by October 1970, a deadline criticized by many. Vice President Spiro Agnew labeled the Commissions' recommendations "pabulum for permissiveness,"(88) and others who viewed the Kent incident from a different perspective, were equally critical of the findings. (89) The secrecy maintained by the National Guard after the shootings in May continued, as none of the men who fired their weapons testified before the Commission. Another problem lay in assessing responsibility for the decision to disperse the rally, a gathering which the Commission labeled "peaceful" prior to the dispersal move by the Guard. Contradictory accounts were provided by Brigadier General Robert Canterbury and Kent State University President Robert White, as each blamed the other for the decision. There was no resolution of this key issue or other moot points. The Guardsmen had not been surrounded. They [the Guardsmen] could have resorted to tear gas rather than shooting. The Akron Beacon Journal's headlined Justice Department story, and its own earlier study of the incident, focused national attention on the discrepancies between the official investigations and the National Guard's explanation of the shooting at Kent. Further pressure was exerted on the Justice Department to convene a Federal Grand Jury to investigate the matter. Admitting that both Guardsmen and students had violated certain laws, Attorney-General John Mitchell suggested the initial step should be taken by proper authorities in Ohio. (95) Governor James A. Rhodes directed Ohio Attorney-General Paul W. Brown to convene a special Ohio Grand Jury to look into the Kent State shootings. (96) This decision effectively removed local Prosecutor Ronald Kane from the position of power, because a Rhodes' protZ�gZ�, Attorney-General Brown, was thus put in charge of appointing prosecutors to present the material to the Grand Jury. Attorney-General Brown, who had remarked in his campaign for office that "all protesters should be put into concentration camps," chose three state prosecutors to present the evidence to the fifteen member jury. (97) One of the prosecutors chosen was Portage County Republican Chairman and lawyer, Seabury Ford, a former member of the Ohio National Guard's 107th Armored Cavalry, and well known for his conservative and anti-student views. (98) The other two prosecutors were Robert Balyeat, a prosecutor from a neighboring county and political ally of Attorney-General Brown, and Perry Dickinson, a former FBI agent and the Democratic party representative on the prosecuting team. Understanding the attitudes, values, and beliefs of the individuals involved, and the events which preceded the Special Grand Jury of Portage County's Report, (110) is extremely important in the analysis of the report. Karl Wallace, noted Scholar of Rhetoric, has written that to understand the audience is to understand the conditions to which its members have been subject, under which its members have suffered,"(111) and it is evident from the discussion above that most of those in Portage County had "suffered" together in their relations with the Kent State students. Life style, behavior, and past actions had all resulted inmost citizens of the Kent area forming definite opinions of the students at Kent State, and it was from this group of people that the Jury was selected. Speculation concerning the daily events in the Special Grand Jury hearing was evident in the Ohio newspapers. An Akron Beacon Journal reporter wrote, "...professors and officials of the university city, and national Guard, students, policemen, firemen, and approximately 100 others testified before the Jury in the Portage County Courthouse in Ravenna, the county seat. "(112) During the Jury's proceedings, Common Pleas Judge Edwin Jones decreed there would be no news media, cameras, recorders, or reporters on the premises. The Grand Jury Report placed ultimate blame for the shootings on the Kent State University Administration, and exonerated the National Guard: twenty-five students and professors were indicted, but not one guardsman was so accused. The Jurors asserted that the university administration's lax policies and inability to rid the campus of troublemakers had set the stage for the violence of May 4, 1970. The Report described the administration's apparent failure to control a radical minority of students and faculty, which had resulted in an overemphasis on dissent in the classrooms, and an inability to govern effectively. En toto, the Grand Jury condoned the shooting incident. It concluded that the National Guardsmen had been surrounded by hostile rioters and were forced to fire their weapons. Thus, under governing Ohio statute, individual guardsmen could not be prosecuted for their actions. The language in the Report reveals predisposition's of the Jurors. Many of the same derisive terms used by General Canterbury and the Guardsmen in their description of the weekend incident were also employed by the Jurors. The Grand Jury negatively described all agents of Kent State University, a source of conflict for many in the Kent area. Students were labeled as "rioters" and "members of the mob"; the Kent State University Police Department was described as "totally inadequate"; and the Kent State administration was described as practicing "laxity, over-indulgence, and permissiveness with its students and faculty...to the extent that it no longer runs the University..." In contrast, the National Guard was viewed in a positive manner throughout the Report. The facts were simple, in the view of the Grand Jury. The administration had lost control of the university to a radical elite bent on destruction of the town and Kent State. Harassed, stoned, over-run, and fearing for their safety the National Guardsmen were forced to fire into the "mob" to save their lives. The responsibility for the incident was obviously on the "rioters" and the Kent State University administration. The Grand Jury's attempt to place the blame for the incident entirely on the University suggests that non-judicial predispositions led to adherence to certain prior biases and corresponding subsequent manipulation of the available data. These biases are indicated by the fact that while other investigations did not cite the University as a responsible agent, the Jurors devoted over half of the Report to culpable University responsibility. Instead of focusing on the events of May 1-4, the Grand Jury Report emphasized attendant disruptions that happened prior to and after the incident. The Grand Jury's failure to question the banning of the May 4 rally, its tendency to identify all dissent with violent dissent, its indictment of selected student and faculty leaders on clearly questionable grounds, and its general argument all seem to point to a commitment not to the rights of the individual but to the use of social and judicial repressive means to exclude and disable opposing groups and views. Underlying all these failures is the implied argument that any opposition groups attempting to criticize established authority or its policies are ipso facto suspect and subject to punishment. The Special Grand Jury of Portage County did not seriously attempt to objectively discover the facts concerning the Kent State incident. Ignoring other investigations, the Grand Jury formulated an interpretation based not on facts, but on opinions, beliefs, and values acceptable to the average citizen of Portage County, Ohio, who did not need an investigation of the Kent shootings to know who was at fault. by trade was interviewed by members of the Knight newspaper chain. that they were in danger of serious bodily harm or death from the students. In his investigation into the possibility of fabrication of evidence on the part of the National Guard, I. F. Stone learned from a President's Commission "source" that "raw FBI depositions from the Guardsmen" had resulted in the Bureau's suspicion "because about thirty of them [the Guardsmen] used virtually identical phrases in describing their danger from the students. ( 125) Therefore, as the Special Grand Jury of Portage County was about to release its findings which would exonerate the National Guard and blame the students and the administration for the incident of May 4, other sources were seriously questioning the Guard's explanation for the shooting. frightened... Why do we have to be subjected to this kind of thing? Jerry Rubin said right on campus "Get a gun and shoot your parents." Disagreement with the Grand Jury Report and the indictments resulted in two separate civil suits challenging the Report and its findings. (182) The suits, filed by a group of professors, indicted students, alumni of Kent State, and several clergymen, were heard on January 28, 1970. Federal Judge William K. Thomas rules the Report was "unconstitutional" and "ordered it expunged from the records and physically destroyed. "(183) To the dismay of those who initiated the action, the Judge paradoxically upheld the indictments rendered by the Grand Jury. Therefore, while the Report was to be destroyed, the indictments it handed down were to stand. mostly in Troop G, to shoot upon a signal at the top of the hill. and that, despite his denials, the guardsman fired his .45 repeatedly. stopped everything and that justifies the killing in their mind. In 1973 further developments arose in the Watergate incident and more Americans began to question the past actions of the Nixon administration. Former Attorney-General John Mitchell was indicted for perjury and obstructing justice. Attorney-General Richard Kleindienst resigned from the Justice Department. As the Watergate hearings revealed more damaging information about the Nixon administration's past actions, previously unknown facts regarding various facts began to surface. Three years after the gunfire at Kent State, Deputy Assistant Attorney-General William O'Connor indicated that the Justice Department's long silence on the possibility of violation of civil rights in the shooting incident was inconsistent with the facts collected by the department. (244) According to O'Connor, the department had in its possession evidence which would have resulted in the indictment of several Guardsmen for depriving those killed of their constitutionally guaranteed civil rights. O'Connor also commented that no action was taken by the Justice Department because prosecution of indicted Guardsmen would have been "unlikely. : (245) This revelation prompted Arthur Krause to state in the Christian Science Monitor that the decision by the federal government "means the Justice Department is acting as the judge and the jury." (246). The new Attorney-General, Elliot Richardson, responding to the pleas for a Federal Grand Jury by the press and those who had favored an official inquiry, directed the Justice Department to study the Kent matter. (247) With the Watergate scandal unraveling before the nation's television audiences, many congressmen became suspect of the Justice Department's handling of the Kent incident. Many suggested that a congressional inquiry be conducted into the matter. Peter Davies learned from congressional counsel Don Edwards that the list of those to appear before the hearing would include former Attorney-Generals Mitchell and Kleindienst, Guard officials, General Del Corso and General Canterbury, and former White House employees John Erlichman and John Dean. (248) The latter officials were being considered to testify because of the growing concern of possible White House involvement and interference in the Justice Department's inaction on the Kent State case. 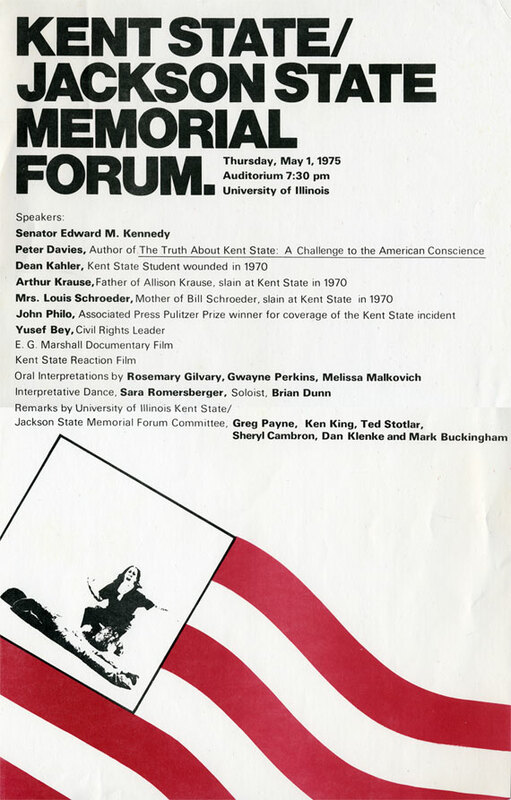 As Peter Davies' book on Kent State was being published and prepared for distribution, Attorney-General Richardson concluded that his initial study of the matter supported his decision to convene a Federal Grand Jury to investigate the incident. Peter Davies' interest in the Kent state incident has spawned thousands of letters, publications, and scores of speeches on college campuses and before television cameras. (256) All these efforts have been aimed at a complete airing of the facts surrounding the shooting at Kent State. In The Truth About Kent State, Davies reached three general conclusions which he believed exposed major questions about the Kent State incident. First, he concluded that overall individual ineptitude set the stage for the shooting incident. Davies raised questions of possible criminal and civil liability not examined by the Grand Jury. Second, Davies concluded that the student rally on the University Commons prior to the shooting was legally justified. This the Grand Jury view and raised the question of who, and under what authority, ordered the gathering banned and whether the students' civil rights were violated. Third, directly contradicting the Grand Jury finding, he concluded that the guardsmen were not surrounded and were not in mortal danger at the time of the shooting, and that this fact together with other evidence supported the allegation that a conspiracy developed among guardsmen to fire on students. None of the date or claims offered by Davies was contradicted by the President's Commission or the FBI Report. Davies thus raised the possibility of a criminal conspiracy to violate civil rights. His conclusions suggested questions which Davies hoped would persuade the American people to demand that the federal government would convene a federal grand jury to investigate the incident. The following excerpt of the Los Angeles Times review of Davies' book is indicative of the media response to the publication, as it received national attention at the time of its September, 1973, release. guardsmen and the students they killed and the distance between them. On December 12, 1973, one day after Saxbe would be confirmed by the Senate as the new Attorney-General, the acting head of the Justice Department officially directed the department to impanel a federal grand jury to investigate the shootings at Kent. (274) Thus, the nearly four year effort to have a federal grand jury convened had become a reality. The Kent State University newspaper, The Daily Kent Stater, viewed the convening of a federal grand jury as "the long awaited response to calls from students, parents, congressmen, citizens and newspaper editorials." (275) This action was precisely what Davies had sought in his initial "Appeal For Justice" article and his current and more comprehensive publication, The Truth About Kent State: A Challenge to the American Conscience. Now there would be a conscientious effort to obtain the facts about what happened at Kent State on May 4, 1970. The federal grand jury held its deliberations in Cleveland during the last week in March, 1974. After four days of hearing the case against various agents involved in the incident, the grand jury returned indictments against eight guardsmen for the "willful violation...of civil rights of the students killed or wounded." (276) The trial of the indicted guardsmen was set to begin in the autumn of 1974. The defense, on the other hand, argued that the situation at Kent during the May 1-4 weekend was "tantamount to war." (308) Although prior investigations had ruled out the possibility of a sniper, the defense included it as a rationale for the shooting. The Guard, argued the defense, had only responded to the situation created by "thousands of demonstrators." (309) According to his attorney, Governor Rhodes had never assumed control of the situation and had only called in the Guard into Kent "to assist local law enforcement." (310) President White's attorney argued that the former Kent State head had done nothing to cause the deaths and injuries at Kent State. In early 1977, Peter Davies decided to donate his Kent State research materials to the Yale Archives. Hyman Kritzer, a Kent State librarian, denounced Davies "outrageous" decision and accused the author of "paranoia." (337) Davies apprehension about the safety of his collection being housed at Kent, however, was shared by others who also gave their papers to Yale. (Including Paul Keane, Robbie Stamps, the author and others). At the April 1977 Yale Kent State Colloquium commemorating Davies' donation, Lowell Weicker, formerly a member of the Senate Watergate Committee, told the crowd, "The system of justice after Kent State did not work properly....The justice system was neither devoid of politics, nor impartial, not courageous, In fact, it was chicken." (338) During the five day conference, Davies shed new light on the reasons for his gift going to Yale. The author explained that Kent State was chosen to serve as the government's "example" against student demonstrations only after it proved impossible for them to use Yale, due to the professionalism of Police Chief James Ahern of New Haven. (339) Furthermore, Davies reiterated his claim that the FBI had planned the violence at Yale in 1970 because university president Kingman Brewster was considered "the number one intellectual enemy at the White House." (340) That year the first dramatic rendering of the incident, Kent State: A Wake, was performed at Yale and Kent State. This writer's theater offered a synoptic recounting of the May 1-4 weekend activities from the perspective of Mrs. Florence Schroeder, mother of slain student Bill Schroeder. Two films, Confrontation at Kent State and Kent State: May 1970, had been previously released. (341) But the Wake was the first stage portrayal of the shootings and the aftermath. On July 12, Kent State once again made their refusal to obey a judge's orders to vacate the grounds. John Kifner of the New York Times reported peaceful arrests were made by officers "carrying no guns this time." (349) Among those arrested were Mr. and Mrs. Martin Scheuer and the parents of wounded student Alan Canfora. All arrested were charged with contempt of court and later released on $250 bail each. In August 1978, the university administrators refused to commemorate the Kent victims with a sculpture designed by George Segal. Officials explained that the memorial's "Abraham and Isaac" theme was rejected as "inappropriate." (362) The sculpture was later dedicated at Princeton University, in memory of the four dead Kent students. In November, the 6th District Court rejected Governor Rhodes' request for dismissal of the civil suit. Attorney Sanford Rosen was retained by the Plaintiffs as lead counsel for the new civil trial which began in Cleveland in December 1978. Others joining Rosen, on behalf of the plaintiffs included David Ehgdahl, a lawyer and photographic expert on the incident. The withdrawal from the case by Judge Don Young, who had presided over the 1975 trial, pleased the plaintiffs because of their shared belief that he had not rendered fair rulings in that previous trail. (363) The new trial was presided over by Judge William K. Thomas. While the plaintiffs insisted that the "statement of regret" was an "apology," the defendants disagreed, (374) Not surprisingly, reactions to the settlement were mixed. One writer asked, "...shouldn't policemen who were seriously injured in student riots receive similar sympathy and payments from the universities, or teachers involved." (375) Another complained, though, that the payment was a "paltry sum" and suggested that not much had changed as a result of the settlement. for our community to withstand. The summer of 1980 witnessed summer school as usual at Kent State. The NBC movie had been refused permission to film on the Ohio campus. Production crews were preparing for a thirty day shoot in Gadsden, Alabama, a site chosen because of its geographical similarity to Kent and Kent State. In the fall of 1980, additional information from the FBI investigation on Kent State housed at the National Archives was released to the public. This information revealed that President Nixon instructed FBI Director J. Edgar Hoover-who thought the four victims "got what the deserved" (391) -to find information in the fall of 1970 to substantiate the Guardsmen's claims about the incident. Nixon's directive was issued during the FBI's investigation of the incident. (392) Despite the recent shocking revelations, thousands of pages of the FBI report remain classified therefore, unavailable for public scrutiny. 56. Joe Eszterhas, 13 Seconds, p. 11; Casale, Kent Affair, p. 8-29. 57. Casale, Kent Affair, p. 8-29. 58. Davies, The Truth About Kent, p. 21; Eszterhas, 13 Seconds, p. 110-111. 59. Eszterhas, 13 Seconds, p. 100-111. 62. The Cleveland Plain Dealer, May 10, 1970. 64. Akron Beacon Journal, May 6, 1970. 65. New York Times, June 13, 1970, p. 23. 67. Eszterhas, 13 Seconds, p. 299-308. 69. New York Times, May 5, 1970, p. 1. 70. Eszterhas, 13 Seconds, p. 279-280. 71. Akron Beacon Journal, May 6, 1970. 72. New York Times, May 6, 1970, p. 19. 73. Newsweek, May 25, 1970, p. 30. 74. Casale, Kent Affair, p. 24. 76. New York Times, May 9, 1970, p. 10. 77. "The Search for Understanding," Stone, The Killings at Kent State, pp. 104-106. 78. Davies, Truth About Kent, p. 142. 79. Eszterhas, 13 Seconds, p. 287. 82. New York Times, May 25, 1970, p. 1. 84. Those chosen were: William Scranton, Chairman; former governor of Pennsylvania; James F. Ahern, Chief of new haven Police Dept. ; Erwin D. Canham, Editor of Christian Science Monitor; James E. Cheek, President of Howard University; Lt. Gen. Ben O. Davis, USAF (Ret.) Director, civil Aviation Security, Dept. of Transportation; Martha A. Derthick, Assoc. Prof., boston college; Bayless manning, Dean, Stanford Law School; Revius O. Oritque, Jr., Attorney, new Orleans; Joseph Rhodes, Jr., Junior Fellow, harvard University. 85. President's Commission, pp. 233-410. 86. New York Times, Sept. 30, 1970, p. 35. 87. New York Times, Dec. 30, 1970, p. 40. 88. New York Times, Sept. 30, 1970, p. 35. 89. New York Times, Sept. 29, 1970, p. 35. 90. Truth About Kent, p. 152. 91. Akron Beacon Journal, July 26, 1970. 92. Akron Beacon Journal, July 23, 1970. 94. New York Times, July 24, 1970, p. 2. 95. Christian Science Monitor, Aug. 6, 1970. 97. Joe Eszterhas, "Ohio Honors Its Dead," Rolling Stone, June 10, 1971, p. 48. 98. Nation, Nov. 23, 1970, p. 517; New Republic, Nov. 7, 1970, p. 16. 99. Davies, Truth About Kent, p. 152. 100. New Your times, Aug. 7, 1970, p. 60. 103. Akron Beacon Journal, Sept. 13, 1970. 104. Samuel G. Kling, The Complete Guide to Everyday Law, (Chicago: Follett Publishing Co., 1966), p. 398. 105. Illinois Revised Statutes for 1975, Criminal Law and procedures, chap. 38, Article 112, Sect. D.
106. New Republic, Nov. 7, 1970, p. 14. 108. Eszterhas, 13 Seconds. p. 2. 109. Akron Beacon Journal, May 5-25, 1970; Kent Ravenna Record courier, May 5-25, 1970. 110. The text of the Report appears in the Appendix. 111.Karl Wallace, Understanding the Media: The Speech Act and Rhetorical Action (Baton Rouge: Louisiana State University, 1970), p. 74. 112. Akron Beacon Journal, Sept. 13, 1970. 113. Akron Beacon Journal, Sept. 17, 1970. 114. Davies, truth About Kent, p. 159. 115. Nation, Nov. 23, 1970, pp. 517-518. 118. FBI Summary, p. 84. 119. Akron Beacon Journal, Aug. 14, 1971. 120. Newsweek, May 25, 1970, p. 30. 121. New York Times, Oct. 30, 1970, p. 24. 122. FBI Summary, p. 84. 123. Akron Beacon Journal, Oct. 23, 1970. 124. FBI Summary, p. 84. 125. I.F. Stone, New York Review, Dec. 3, 1970. 126. President's Commission, pp. 215-216. 127. Kent-Ravenna Record Courier, Oct. 19, 1970. 128. Nation, Nov. 23, 1970, p. 519. 129. Akron Beacon Journal, Oct. 18, 1970. 130. Daily Kent Stater, Oct. 27, 1970. 132. Akron Beacon Journal, Nov. 18, 1970. 133. Davies, Truth About Kent, p. 160. 135. Casale, Kent Affair, p. 198. 137. Michner, Kent State, p. 532. 139. Akron Beacon Journal, Oct. 24, 1970. 145. Ibid., Oct. 25, 1970. 148, Casale, Kent Affair, p. 198. 152. Kent Ravenna Record Courier, Nov. 3, 1970. 157. Akron Beacon Journal, Nov. 4, 1970. 164. New York Post, Nov. 3, 1970. 165. Akron Beacon Journal, Nov. 10, 1970. 172. Kent-Ravenna Record Courier, Nov. 3, 1970. 173. Akron Beacon Journal, Nov. 9, 1970. 174. New York Times, Oct. 30, 1970, p. 24. 175. Ibid., Oct, 18, 1970, p. 24. 175. Ibid., Oct. 18, 1970, p. 3. 176. Casale, Kent Affair, p. 199. 177. Davies, Truth About Kent, p. 167. 178. New York Times, Oct. 18, 1970, IV, p. 3. 179. President's Commission, p. 234. 180. Akron Beacon Journal, Dec. 10, 1970. 182. Ibid., Jan 29, 1971. 184. New York Times, Oct. 23, 1971, p. 17. 185. Ibid., Nov. 23, 1971, p. 20. 186. Ibid, Nov. 23, 1971, p. 20; Dec. 8, 1971, p. 15. 187. Ibid., Dec 8, 1971, p. 15. 188. Akron Beacon Journal, Dec. 1970. 189. Davies, Truth About Kent, pp. 152-166; New York imes, Oct. 17, 1970, p. 28; Oct. 18, 1970, p. 3; Oct. 21, 1970, p. 35; Oct. 23, 1970, p. 1; Oct, 25, 1970, p. 70; June 20, 1970, p. 33. 190. President's Commission, p. 234. 191. FBI Report pp. 83-101. 192. Davies, Truth About Kent, p. 7. 198. Information contained in a personal letter from Peter Davies to J. Gregory Payne, Jan. 23, 1976. 199. Michner, Kent State, p. 409. 200. Davies, Truth About Kent, p. 9. 201. "CBS Evening News," Columbia Broadcasting Company, July 22, 1971. 202. FBI Report, p. 84. 203. Davies, Truth About Kent, p. 170. 205. Dayton Daily News, July 21, 1971. 206. New York Post, July 30, 1971. 207. New York Times, July 25, 1971, p. 28. 209. Ibid., Aug. 3, 1971, p. 44. 210. Christian Science Monitor, Aug. 9, 1971. 212. Akron Beacon Journal, Aug. 14, 1971. 215. New York Times, Sept. 12, 1971, p. 70. 216. Akron Beacon Journal, Aug. 14, 1971. 220. Christian Science Monitor, Aug. 6, 1971. 221. New York Times, Aug. 18, 1971, p. 36. 222. Information contained in letter from Rev. John Adams of the United Methodist church to the New York Times, Aug. 20, 1971. 224. Akron Beacon Journal, Aug. 17, 1971. 227. New York Times, Oct. 20, 1971, p. 20. 229. Ibid., Nov. 18, 1971, p. 11. 230. Information contained in letter to Carolyn D. Wilhelm from Ohio rep. Richard Celeste, Oct. 27, 1971. 231. Mrs. Florence Schroeder, "18 Months Later: Families of the Kent Dead Speak Out," american Report, Nov. 12, 1971. 232. New York Times, Apr. 30, 1972, p. 27. 233. Comments by James Ahern contained in Davies, Truth About Kent, p. 194. 235. Information contained in a personal letter to J. Gregory Payne from the U.S. Justice Department, April 4, 1972. 236. Davies, Truth About Kent, p. 196. 237. Jack Bass and Jack Nelson, The Orangeburg Massacre (New York: World, 1970), p. 179. 238. Davies, Truth About Kent, pp. 196-197. 239. New York Times, July 12, 1972, p. 16. 240. Information contained in a letter from Senator Edward M. Kennedy to Attorney General Richard Kleindienst, Aug. 17, 1972. 242. Davies, Truth About Kent, p. 202. 244. Christian Science Monitor, June 19, 1973. 247. New York Times, June 14, 1973, p. 8. 248. Information contained in a personal letter from Peter Davies to J. Gregory Payne, Dec. 13, 1975. 253. New York Post, Oct. 3, 1973. 254. Davies, Truth About Kent, p. 4. 256. Peter Davies, Speech delivered at the University of Illinois Kent State-Jackson State Memorial Forum, Urbana-Champaign, May 1, 1975. 257. Los angeles Times, Sept. 2, 1973. 260. New York Times Book Review, Sept. 2, 1973, p. 1. 262. New York Post, Oct. 3, 1973. 263. New York Times Book Review, Sept. 2, 1973, p. 1. 264. Los angeles Times, Sept. 2, 1973. 265. New York Times Book Review, Sept 2, 1973, p. 1. 271. New York Post, Oct. 3, 1973. 272. Information contained in a personal letter from Peter Davies to J. Gregory Payne, Jan. 23, 1970. 275. The Daily Kent Stater, May 2, 1975. 277. Akron Beacon Journal, Oct. 16, 1974. 279. Ibid., Oct. 20, 1974. 280. Ibid., Oct. 9, 1974. 282. Information contained in a personal letter from Peter Davies to J. Gragory Payne, Feb. 12, 1976. 283. The Daily Kent Stater, May 2, 1975. 284. The Evansville (ind.) Courier and Press, Dec. 12, 1974. 288. Peter Davies, Speech delivered at University of Illinois Kent State-Jackson State Memorial Forum, Urbana-Champaign, May 1, 1975. 294. The Daily Kent Stater, May 2, 1975. 297. New York Times, Nov. 18, 1972, p. 29. 298. Ibid., June 26, 1973, p. 28. 299. Information contained in a personal letter from Peter Davies to J. Gregory Payne, Feb. 12, 1976. 302. Cleveland Press, June 4, 1975. 303. Akron Beacon Journal, June 19, 1975. 304. Cleveland Plain Dealer, May 29, 1975. 311. Information contained in a letter from Peter Davies to J. Gregory Payne, Feb. 12, 1976. 312. New York Times, July 1, 1975, p. 13. 313. Ibid., Aug. 28, 1975, p. 1. 314. The Daily Kent Stater, Oct. 3, 1975. 315. Time, Sept 8, 1975, p. 11. 316. The Daily Kent Stater, Sept. 28, 1975. 317. Cleveland Plain Dealer, Sept. 29, 1975. 319. New York Post, Oct. 30, 1975. 320. The Daily Kent Stater, Oct. 3, 1975. 321. Ibid., Nov. 18, 1975. 324. The Daily Kent Stater, Jan. 20, 1976. 325. Cleveland Plain Dealer, Jan. 8, 1976. 329. The Daily Kent Stater, May 5, 1976. 330. Kent-Ravenna Record Courier, May 4, 1976. 331. The Daily Kent Stater, Apr. 8, 1976. 332. Thomas R. Hensley and Jerry M. Lewis, Kent State and May 4th (Dubuque: Kendall/Hunt Publishing Company, 1978), p. 123. 333. Paul Keane, Robert A. Dyal, and Herbert Goldsmith, eds., Kent State F.A.C.T. (First Amendment Conservation TASK FORCE) Newsletter, vol. 1, no. 1, p. 3. 335. The Daily Kent Stater, Nov. 19, 1975. 336. Robert A Dyal, "Too Little and Too Late: The Kent State Faculty and Administrative Response in the Decade After May 4, 1970" in Scott Bills, ed., Kent State Ten Years After (Kent, Ohio: Kent Popular Press, 1980), p. 35. 337. Yale Daily News, Jan. 13, 1977. 338. Akron Beacon Journal, Apr. 4, 1977. 339. Yale Daily News, April 7, 1978. 341. J. Gregory Payne and Mary Woods, Kent State: A Wake (Los Angeles, 1976); Alva I. Cox, Kent State, 1970 (Washington: Cinesthestics, 1972); Richard Myers, Confrontation at Kent State (San Francisco: Canyon Cinema, 1971). 342. Akron Beacon Journal, May 4, 1977. 343. The Daily Kent Stater, May 5, 1977. 346. Hensley, May 4th, p. 129. 347. Keane, F.A.C.T., p. 4. 348. Hensley, May 4th, p. 129. 349. New York Times, July 12, 1977, p. 1. Akron Beacon Journal, Sept. 13, 1977. 355. The Daily Kent Stater, Feb. 23, 1978. 356. See letter on page 63. 357. Akron Beacon Journal, May 5, 1978. 358. Christian Science Monitor, Aug. 6, 1970. 359. Akron Beacon Journal, May 5, 1978. 362. Bills, Ten Years Later, p. 36. 363. Personal conversations with plaintiffs. 364. Sanford Jay Rosen, "Kent State 1980: Finishing Unfinished Business" in Bills, Ten Years After, p. 53. 365. Joseph Kelner and James Munves, The Kent State Coverup (New York: Harper and Row, 1980), p. 265. 366. New York Times, Jan. 8, 1979, p. A-20. 367. Cleveland Press, Jan. 6, 1979. 368. Thomas R. Hensley, "1979 May 4th Federal Civil Trial, Cleveland, Ohio, Jan. 4, 1979. 370. New York Times, Jan. 5, 1979, p. A-12. 374. Akron Beacon Journal, May 4, 1980. 375. New York Times, Jan. 20, 1979, p. A-20. 377. The Daily Kent Stater, May 4, 1979. 378. Charles Thomas, "The Kent State Massacre: Blood on Whose Hands?," Gallery, May 1979. 379. Lettre from Florence Schroeder to J. Gregory Payne, April 15, 1979. 380. Bills, Ten Years After, p. 39. 382. Akron Beacon Journal, May 4, 1980. 384. The Daily Kent Stater, May 2, 1980. 385. Ron Ridenhour, "The Plot to Kill Protest," Valley Advocate, May 7, 1980. 386. The Daily Kent Stater, May 2, 1980. 387. Los Angeles Herald Examiner, July 8, 1980. 389. Personal conversations with J. Gregory Payne, Aug. 10, 1980. 390. Kelner, Coverup, p. 260. 391. The Cleveland State University Cauldron, Nov. 3, 1980.